It's been a decade of lows for commodities after posting 7 declines in 11 years, but we've seriously underestimated lithium. It's back with a vengeance in 2019. The commodities market endured yet another annus horribilis, with just four commodities—natural gas, uranium, cocoa and wheat—recording any uptick at all. Last year's 12 percent slide by the Bloomberg Commodity Index--spurred by 20 percent-plus declines by industrial bellwethers like West Texas Intermediate crude, steel and platinum—came in the wake of two years of modest gains. Viewed against that kind of backdrop, lithium's 50 percent correction that snapped a multi-year winning streak appears less vicious. 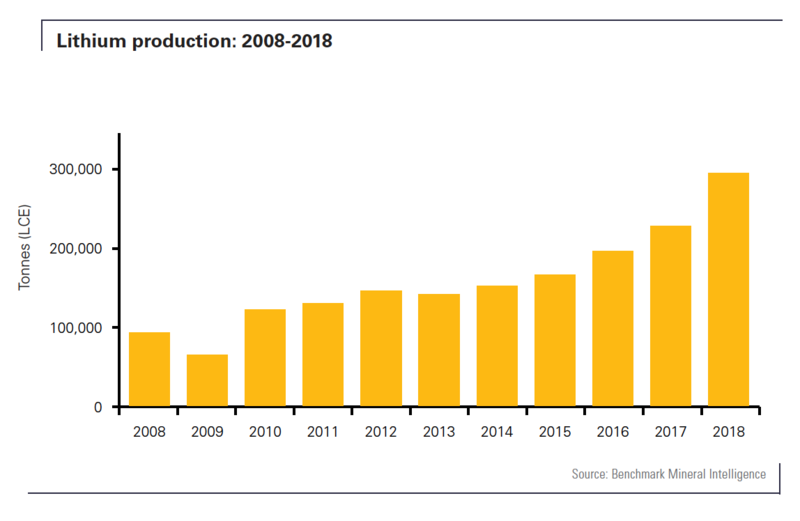 It's important to remember that prior to the crash, lithium had enjoyed a meteoric rise with prices doubling since the beginning of 2016 and nearly quadrupling over the past decade. The fact that much of the rally coincided with a sharp rise in the value of the U.S. dollar makes it all the more remarkable. Unfortunately, it's the latter scenario that took center-stage during last year's lithium crash. A furor around anticipated new supply especially from China's new hard-rock projects and Chilean brine mines got out whack and derailed the market. Shares of major lithium producers and explorers including Sociedad Quimica y Minera de Chile (NYSE:SQM), Albemarle Corp. (NYSE:ALB) and Orocobre Ltd (ASX:ORE) received a severe hammering in March after Morgan Stanley forecast that Chilean low cost brine producers could add as much as 200kt per year by 2025, while expansion of China's and Australia's hard-rock mines could pump in another half a million metric tonnes over the timeframe. That's certainly a massive production ramp-up considering that global production in 2017 totaled just over 200kt. In August, Macquarie Research provided the final straw after chiming in with a warning that the market was "sleepwalking into a tsunami of oversupply." The report put the final nail in the coffin of the decade-long lithium rally-- Fastmarkets reckons that prices for battery-grade lithium carbonate in China, by far the world's largest consumer of high-grade lithium carbonate, tumbled 50.31 percent last year to 75,000-83,000 ($10,885-12,046) yuan per tonne from 158,000-160,000 ($22,932-23,222) yuan per tonne the previous year, as demand waned. 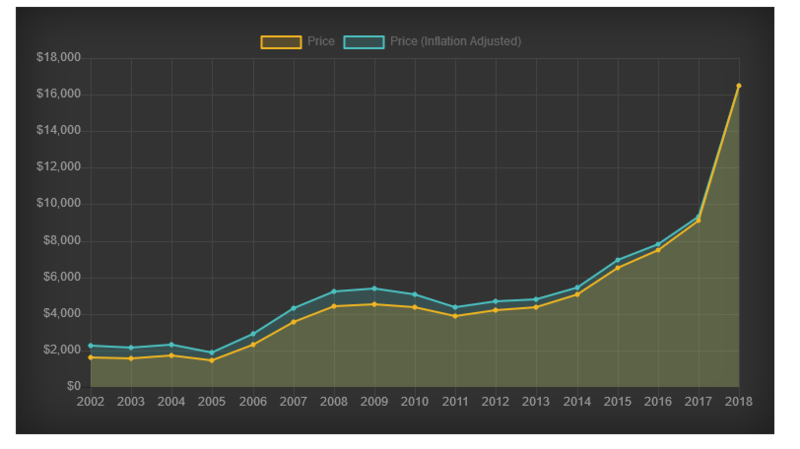 While it's undeniable that the carnage managed to exceed even Morgan Stanley's decidedly pessimistic outlook for global lithium prices to drop 45 percent by 2021, the fundamentals suggest that the selloff was greatly overdone and such low prices cannot be justified by simple market forces of supply and demand. A good case in point is Brisbane-based Orocobre, which has become the poster child for just how challenging new brine mining can be. The company's Salar de Olaroz project in Argentina took seven years to hit its stride but still came up short of production targets. 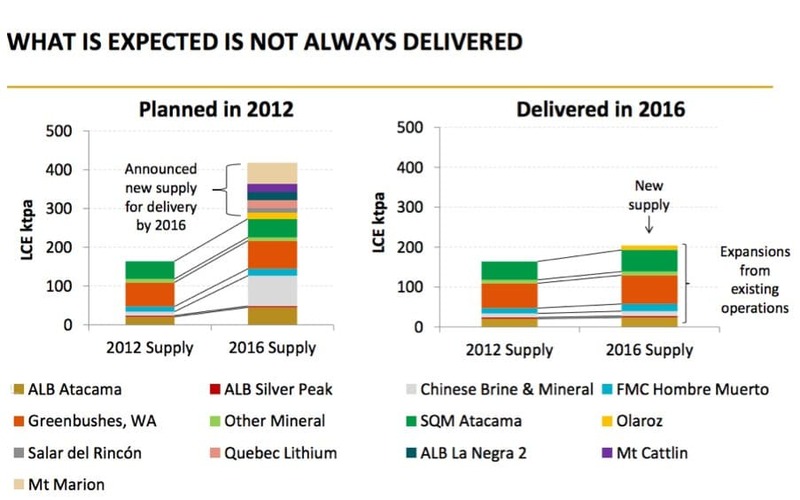 Meanwhile, run-ins with the courts and regulators coupled with mutual accusations of license violations facing Chile's lithium giants SQM and Albemarle at their Atacama brine projects further reinforce this point. The screenshot below from Orocobre's investor slide presentation is a sobering reminder to this reality. 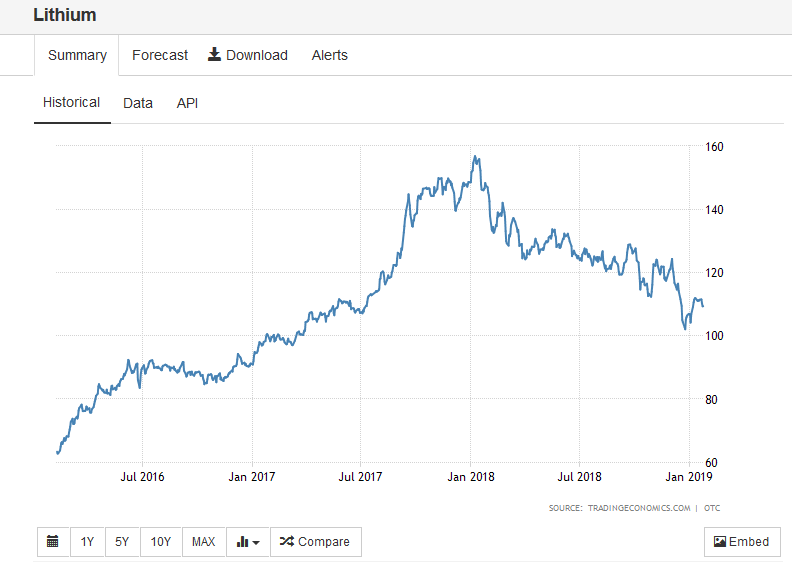 The situation has not been much better in China—the ultimate lynchpin to the lithium bear thesis. Many Chinese brine producers in the Qinghai region had outlined plans to triple or quadruple capacities over the coming 3-4 years. A visit by Benchmark Minerals to these operations, however, has painted a dire picture—the technical challenges related to high magnesium concentrations in the region are nowhere near being comprehensively overcome. Across Qinghai's 10 producers, only an additional 5,000-10,000 tonnes of lithium product found its way to the market, majority of which failed to reach technical grade specifications. This, in effect, means that much of what came online from the region was either reprocessed thus adding to costs or converted to lithium hydroxide in a bid to meet growing demand for nickel-rich cathode technologies. That projection seems to resonate with Elon Musk's ambitious target to build 20 gigafactories across the globe over the next decade. Miller sees 2019 as the tipping point where demand will eventually outstrip supply starting 2020.